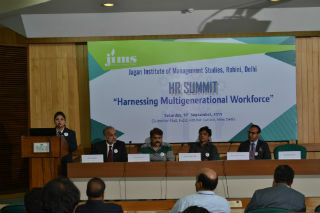 Recognising the significance of the multigenerational workforce and its impact at workplace JIMS Rohini recently organised HR Summit on 19 September 2015 at India Habitat Center,New Delhi on the theme “Harnessing Multigenerational Workforce”. 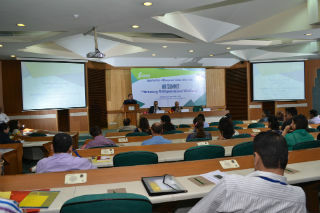 Several HR Executives and managers from leading organisations attended one day event. Apart from them, many freelance HR personnel, faculty members and students majoring in HR also participated. The Inaugural session on ‘Empowering HR for Business growth’ was flagged off with a welcome address by Dr JK Goyal, Director, JIMS, Rohini in which he commented on the economic side of the HR and the need of the organisations to address issues related to the theme. Mr. Anurag Batra, Chairman and Editor-in-Chief BW, Business world, in his key note address highlighted the need of entrepreneurs in current times, He also emphasized building entrepreneurial thought process for this generation and talked passionately about the role of HR as business partner. Mr. Rajnish Dutta, Sr President-Human Capital-Lending division, Yes Bank talked of various HR initiatives taken in his organisations to sustain HR as contributor to business. The Inaugural session concluded with a Vote of Thanks by Dr Pratima Daipuria, Associate Professor, JIMS Rohini. The first panel discussion on‘Role of HR in dynamic business environment’ saw HR professionals brainstorming on the complexities of business and how HR is readying itself. Mr. Rajeev Sahdev, Sr. Vice President, Moser Baer focused on the dynamic nature of HR in changing environment and emphasized that HR has to be ready and make their people ready for competition lurking from anywhere. Mr. Rajkamal Chauhan, Regional Head-North & East, Cushman & Wakefield, spoke about environmental scanning at micro , macro and internal level and the role of HR in setting directions for the organization. He talked of corrective and preventive action (CAPA) that HR can adopt to handle change. Mr. Rajesh Tripathi, Vice President & Head- Human Resources, GHCL, explained about contextual human behavior. He talked about the context in terms of mindset of generations and the loyalty of Gen X towards function, Gen Y to technology and Gen Z to Self. The common factors that affect minset are respect, ownership,trust and integrated team work. Mr. Prateek Dubey, Zonal Manager, PEC North,Hindustan Coca Cola Beverages recoined the term HR as Humesha Reasonable. He structured his thoughts around being realistic and suggested the best strategy to win at work is to collaborate with people. Mr. Surajeet Banerjee, Senior VP-HR, DLF Universal Limited focused on the evolution of HR as most successful and powerful in service sector and emphasized the need of HR to be more conversation focused. Towards the end the delegates also joined in the discussion with the panelists. The session concluded with Ms Pooja Jain, Associate Professor, JIMS, Rohini thanking the delegates and Dr Ashok Bhagat, Dean PGDM(IB), JIMS, Rohini presented mementoes to the guests. The second panel discussion was focused on ‘Talent Acquisition in the Digital Age’. Mr. Deepak Behl, Director (HR), The Grand, who was the session moderator focused on change in management practices by digitalization of each and every part of the HR function. He touched upon the use of social media for the purpose of talent management and how digital age is making life easier as well as challenging. Mr.Ahmad Sabih Kidwai, Director-HR, Schneider Electric deliberated on recruitment practices in current times. There is a huge shortage of competent people in marketplace and every organization wants the best talent. He also gave a message to today’s generation that to excel in specific field it is important to know about each and every aspect of business. Mr. Biju Sebastian, Head HR,Apollo Tyres gave a live example of encroachment of social media in recruitment and perception formation of the candidate. He talked of role of various social media platforms in building organizations and society. Mr. Vishnu Dev, Director-Staffing Manpower group talked about modern practices of recruitment and introduced some lesser heard platforms of social media recruitment as well. Addressing the audience in a special session on Multigenerational workforce, Mr. S Y Siddhiqui, Chief Mentor Maruti Suzuki India Ltd. spoke largely about work culture and how it matters the most. He spoke about the workplace trend and how India has the biggest advantage over China, Germany with the kind of work force we have. He emphasized on various talent management and engagement initiatives across various generations mapping it with various needs and wants. He also emphasized the pillars that drive a successful organisation viz. Culture and leadership. He elaborated the three quotients of Leadership, the Vision Quotient, Business Quotient and the Emotional Quotient and how it impacts the life of people. He ended up with the 98:2 principles of workplace success and the needs to stretch it further. The session ended with a Vote of thanks by Dr B. K. Som, Associate Professor and memento presentation to the speakers by Dean PGDM Program , Dr Sumesh Raizada. 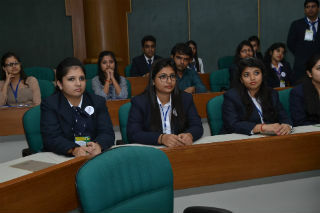 The summit received a very warm reception from the delegates across HR fraternity and the students who participated in the event with great enthusiasm. 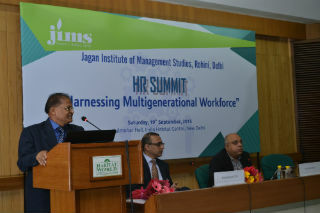 With intriguing discussion and insightful ideas HR Summit 2015 on “Harnessing Multigenerational Workforce”turned out to be a resounding success.